Anish Kapoor started making ‘void’ pieces in 1985, subsequent to the positive geometric forms which had first brought him to prominence. In 1000 Names, for example, separate elements rest directly on the floor or walls, bright with powdered pigment; these were made as part of a daily production routine, and were united by the umbrella title. Repetition fulfills a kind of meditative role for Kapoor, and his idea of an ongoing series where each new thing is part of a whole continues across a variety of media: stone, steel, wax, resin, concrete. For Void the use of fibreglass, which is lightweight, endows a large-scale structure with great durability. Yet Kapoor’s engagement with architectural space is about the excavation of meaning – psychological, mythological or spiritual – beyond purely formal or material concerns. 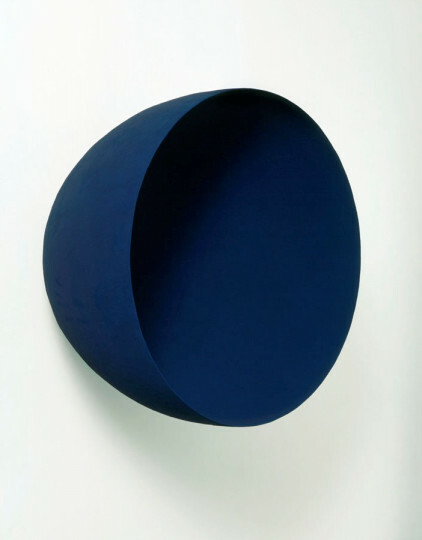 Besides drawing inspiration from Yves Klein, and other Modernist heroes, Joseph Beuys and Marcel Duchamp, Kapoor’s work is fuelled by a problem in sculpture identified by Donald Judd, whereby material is taken as primary and colour as secondary. In Void the swathe of colour acts as something of a magic circle, or Mandala: the perfectly even expanse of colour encourages the eye to lose sense of the the bowl’s proportions as an object; its contours are not so easily navigable. Void encourages a shift of attention towards the optical and cerebral processes of focussing – and a heightened self-consciousness on the viewer’s part.